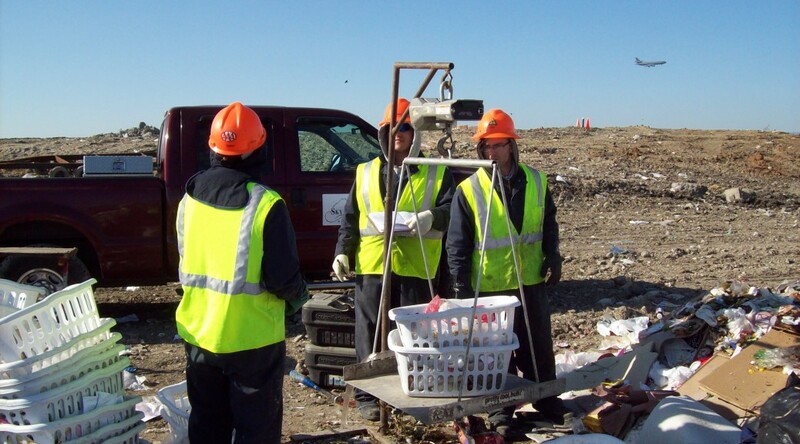 We collect statistical data on the composition of solid waste and recycling material streams. This is the data that solid waste and recycling planners use to figure out what’s being thrown away or recycled. It basically boils down to measuring component percentages-by-weight. How many tons of cardboard, how much green glass, or ferrous metal, or whatever – that sort of thing. This is where those numbers you hear about come from. “We throw away X number of tons of this, and recycled Y number of tons of that”. We sort individual samples, by hand, into whatever components our client is interested in, then weigh it out for each sample. We do this over, and over, and over (the statistics part), until we have reasonable data that tells us what’s there. Sound like fun? Challenging would be a better description. Picking through 200-pound samples of residential garbage in 117-degree heat next to the active face of a busy landfill certainly doesn’t qualify as “fun”. But, it’s what we sometimes must to do to get the required data. I’ve been doing this professionally since 1987, and the past 30 years have brought many changes in the way we view and manage soild wastes. This website is currently undergoing a major renovation, so thanks for your patience!